Discussion in 'Other Manufacturers' started by sicily428, Apr 22, 2018. Opening your machine, tampering with hardware in any way, using different bioses from other Resellers may VOID your warranty. It's all up to your skills to continue from here and you must take responsibility for all the potential damage it may occur . here just a copy and paste of the guide made by @Blebleuh http://forum.notebookreview.com/thr...ongfang-gk5cn6z.815943/page-109#post-10809196 !!!!!! !ONLY for GTX versions!!!!! None of the methods, software or tips explained here is absolutely safe. Be sure of what you do, and do it at your own risks ! - Exetrnal topic : Illegear (Malaysia) sells blue (clicky) and brown (silent) switches with 2 different caps layers, for the moment only to their clients. - PCS sells a 17.3" GK5CN (Recoil II) which seems to have the exact same keyboard as the 15.6", but with silent switches and sober layout. Replacement keyboards with brown switches will come soon ! If no one yet knew, there are 3 version of the blue switch currently, v1 is from the earliest models, v2 has better response, sharper click, v3 refines it even more. Brown switches have two versions, v1 from the time Overpowered started and v2 that is going to be closer to a silent switch. There are 3 versions of keycaps for the keyboard, the square version is v1 (there might be a stabilized version of v1), the oval is the v2 which is more stable in the switch, v3 is in development I heard which is to be also an oval and is to be even more stable than v2. 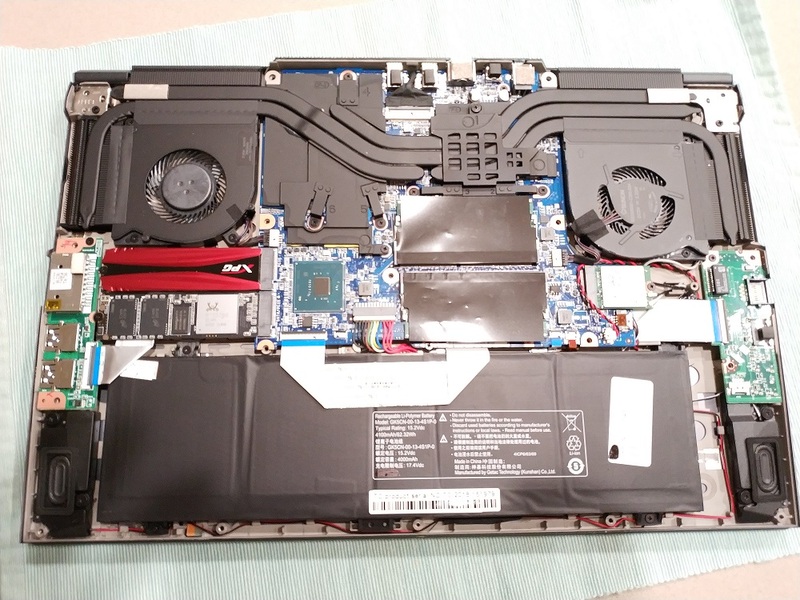 -You can find in the image below part number of most spare parts of this laptop. Comes from this page. Fans can be normally or abnormally noisy. You can see this video (done by @lKinder_Bueno ) to get an idea of what should be a "normal" noise. - Gaming fan mode turned on into the Fans settings tab of the Gaming Center. This mode can be a little bit noisy. If you don't need a lot of power, switch to way quieter Office mode. Keep in mind that it sets CPU power limits at 35W instead of 55 and 65 in Gaming mode. - a mechanical issue that can be solved by opening your computer and carefully disassemble and check the fans. Also, have a look at "Fixing the hardware issues" rubric. - a laptop running too hot, because of dirty fans, badly thermal pasted CPU and/or GPU, or weird performance settings. HOW TO FLASH YOUR BIOS/EC ? There is two main methods. - Easy but risky: using automatic batch installer.This method is depreciated: you might brick your laptop. To proceed, first close all apps, unplung every external device, except power adapter, then run F.bat and follow instructions. 0. Download & unzip the firmware and copy the 3 folders on USB stick. 0.5. Power on and tap F2 key repeatedly. Bios will open up. Go in Security > Secure Boot > Disabled. Press F4 for save the changes and reboot. 1. 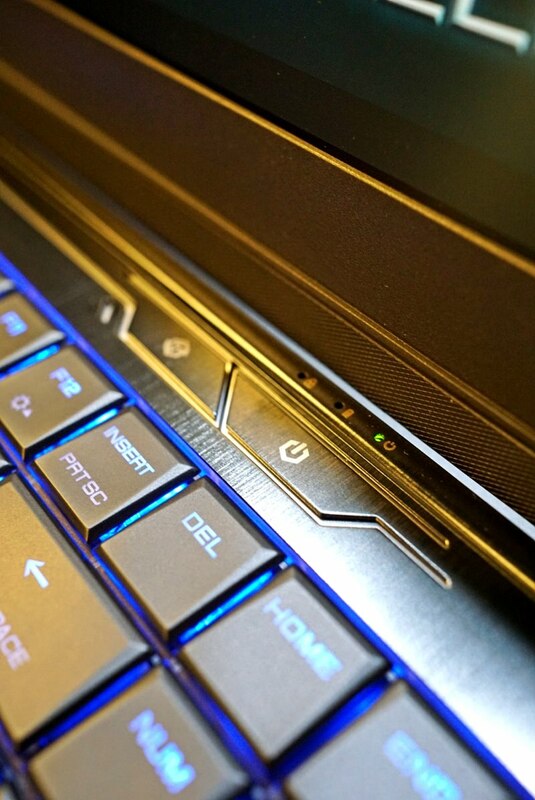 Power on and tap the F10 key repeatedly as soon as you turn on the system. This will bring up the boot menu. 2. Select USB flash drive from the boot menu and press [Enter] to select this option. 3. This will open the EFI Shell. At the top of the screen, your drives are listed under ‘fs#’, where # is the drive number. Please find the drive number associated with your ‘Removable Drive’, it will be described as a USB Device and should be the bottom most option on the list. the laptop will shutdown and update the EC. 5. Power the system back on and tap the F7 key repeatedly while laptop boots to re-enter the boot menu. 6. Select USB flash drive from the boot menu and press [Enter] to select this option. Type the following commands. the laptop will shutdown and update the BIOS. 7. Power on and tap F2 key repeatedly. Bios will open up. Press F3 to load Optimized Value. Go in Security > Secure Boot > Enabled. Press F4 for save the changes and reboot. "Gaming Center 1 - made for GK5CN5Z and 6Z"
- 1.2.3.4 - from Mechrevo - modded with classic icones, no animation, no welcome splash with music, and english as default lang. How to disable animations ? If you didn't followed these steps before installing Gaming center, you can still disable animations by modifying the registry so way is depreciated. - Edit Animation entry by double clicking on it, set the value to 0, then press OK.
How to change Gaming center's appearance ? Some GK5CN sellers provide customized versions of the Gaming Center with a branded skin. Is there any alternative to Gaming Center ? There now two ! The most exciting one is called Rev.Center, developped by @lKinder_Bueno especially for us and soon on github. The second one is called MyApp, a kind of simplified Control Center made by TongFang for previous chassis but still GK5CN compatible.We don't exactly know how it interacts with Control Center, which still has features MyApp dont have. See this post and following pages. It seems to cause troubles with some anti-cheat securities from some games. Is there any alternative solution for controlling fan speed? Some issues (erratic on/off and behavior) regarding the keyboard, its backlights, and fans have been fixed by carefully checking mobo connections to these components and/or wiring management, as some wires might be jammed by a screw. Some touchpad erratic behaviors have been fixed by applying a bit of pressure on the touchpad part that face to the battery (behind the battery). How to get better / louder audio ? How to get better screen refresh rate ? It is possible to increase a little bit refresh rate of the screen. Instructions in this link. @lKinder_Bueno went from 60 to 64Hz, and some other went from 144Hz to 156Hz on another laptop that use the same 144Hz panel. Solutions to get the touchpad working under Linux have been found here. - For a Linux distro with 4.15 Kernel : download patches located here and run them. You may need to re-apply a few of them (especially linux-image-unsigned-4.15.0-34-generic.deb) after a system update. Performance modes changes minimum and maximum CPU speed as and Windows power plans (known as My******* in Windows Power Option configuration panel). - Plug your AC adapter in ! - In Gaming Center, switch to Gaming mode in the fans settings, and to Equilibrium mode in the the System Monitor tab. Performance modes "High performance" and "Game mode" just constantly max out CPU frequency, which is useless and seems to give worst perfs, as i7 8750H and i5 8300H are made to fastly change frequency by themselve. - Update to last BIOS, EC and Gaming center versions. So far (january 2019) the combination of most recent versions of BIOS (1.05 from OverPowered), EC (1.35.09) and Gaming Center (1.2.2.8) seems to be a solid choice. See above ######## BIOS + EC part for download links and instructions. - Give a try to OEMSev, as some laptops might be sent with a firmware power limitation that doesnt fit the used AC adapter. Furthermore, a BIOS/EC update can reset this setting, so you might need to use OEMSev again after BIOS/EC update, especially if you have GK5CN6Z with 180W power adapter. Instructions below. - Try to undervolt CPU core and cache offsets of around 125mV with Throttlestop. You should notice slightly lower temps and better perfs. A 2017 Throttlestop guide is available here while the thread with download links and a lot of useful information is there. Information about undervolting under Linux can be found here. A tutorial video specifically made for GK5CN laptops by @B0B is available here ! - 35W limitation when in Office fan mode (as well as default 55 and 65 PL1 and PL2) can be overriden in ThrottleStop by toggling "Disable and Lock Turbo Power Limits" into FIVR window, then set proper values in TPL window (such as 60 for Turbo Boost Long Power Max and 70 for the Short Power Max). - Go dual channel RAM ! Best is to buy 2 exact same sticks, but differents might also work. - It doesn't have to be necessary but it helps anyway: replace stock thermal paste under CPU and GPU heatsinks with higher grade and thick thermal paste. Conductonaut is best but very tricky to use as it is liquid metal (can easily break yout laptop). Kryonaut and Noctua NT-H1 are not good choices (even if they're good for desktop PC) because they're too thin and pump out easily. Gelid GC Extreme or DC Diamond are good. Just in case, here are picture and details about thermal pads, if you want to replace them as well. @ditchmagnet got better results by adding a foil under screws of the heatsink in order to get more pressure and it seems to work.It seem to avoid big temp differences between cores (might also hapen because of a thin paste pumped out). OEMsev : "A tool to flash your system when changing adapter and other components." Furthermore, a BIOS/EC update can reset this setting, so you might need to use OEMSev again after BIOS/EC update, especially if you have GK5CN6Z with 180W power adapter. =>Help : Print all command sets. =>RWBlock0 : Reada/Write Block 0 data. =>MeUnlock : UnLock Intel ME region. =>RgbLb : RGB LightBar Configurations. =>AdpType : Adapter Type configuration. =>NbType : Notebook Type selection. =>HiddenPage : Enable/Disable the Hidden Page in BIOS Setup. =>LOGO : Dump/Load Logo data. =>SetApCtrl : Set AP support control. =>RgbKb : RGB Keyboard configuration. =>OCValue : Nvidia OverClocking configuration. =>SWBID : SW Board ID configuration. =>KBLBID : Set KB Board ID configuration. =>OemTdr : OEM TDR configuration. - Maybe you will need softer undervolting settings when your laptop is unpluged if you want to avoid crashes. You can do it in Throttlestop by setting a battery profile and specifing it in the Option window (toggle "Battery profile" and set the number of your battery profile. If you use high TPL values for when your laptop is pluged in, you might limit current drain when on battery by decreasing CPU core IccMax values (and maybe also PP0 ?) in FIVR window for the battery profile. ######## What are remaining challenges for this awesome laptop ? A lot! Here is a list summarized by @dreamcat4 that can be found here. Feel free to share your suggestion ! lewdvig, stesteste, richierich and 6 others like this. is this the barebone you were talking about? As mentioned, our version has a different keyboard and sandblast aluminium finish...i can't say more until we release our version, but this will be in a couple of weeks. Vasudev and sicily428 like this. I'm probably getting one of these soon, will post more details when I do. That said, I have spent some time with a sample unit though so these are my initial thoughts. 1) Runs quite cool for a 1060 "thin-and-light", even at full loads - bottom part gets around 45 degrees at the hottest point, after 20-ish minutes of Furmark (tested with an IR Thermometer). Fan curves seems not bad too, plus there's always the "panic-button" (the full fan override button) if things ever get too hot. 2) Sturdy build (A and B panels are metal, lid cover considerably sturdier then the MSI GS series or the Clevo P950 series). 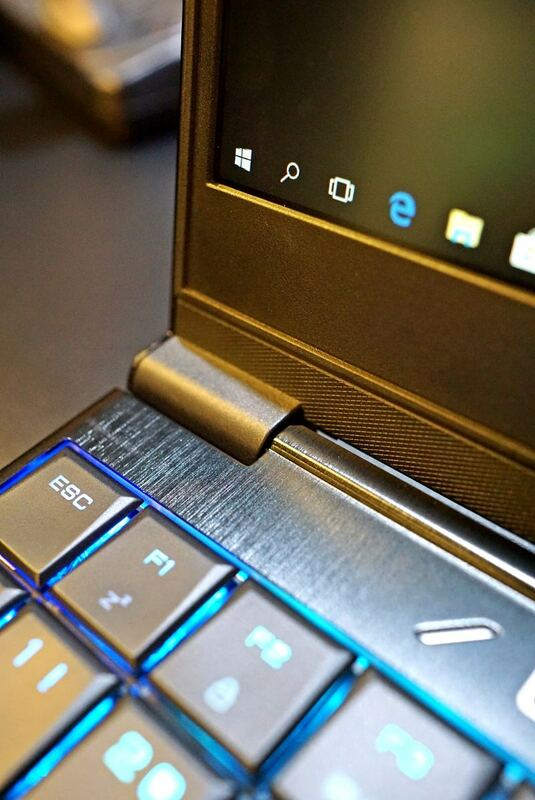 3) 60hz screen is the same panel used on the Aero 15/15X Mk 1 (at least on the unit I tested). Not a bad panel (though not the best either). 4) The thin bazels are deceptively sturdy, feels better then what the GS65 has (but probably worse the Aero 15's full laminated, Macbook-style screen, even if those are a PITA for maintenance). 5) Very easy to get into for maintenance / upgrades (a few bottom screws and you're in). Also none of that upside down motherboard silliness that the equivalent MSIs have. 6) Possibly external G-Sync capable (as the HDMI at least runs off the Nvidia rather then off the iGPU). 7) 2x M2 NVMe slots + 2.5 SATA bay for a whole host of storage possibilities. 8) Runs at about 40-ish dba at full (Furmark) load (tested with a phone app with my phone mic put 5cm from the right / left vents). Also, adjustable fan curves FTW. 9) "Mechanical" KBB feels awesome to type on, but IS considerably "clicky-er" than the KBB on the GS65 (which feels mushy in comparison). However, it's an Alienware type aka "old-style" type KBB (NOT an island or chiclet type like on most other similar notebooks) so it might take a while to get used to for touch-typing. 1) ... no TB3 (yep, unfortunately). 2) Card reader is of the "half-in" type and only runs at USB2.0 speeds. 3) 3-4 hour battery life (with the current battery config, supposedly an optional config is coming that sacrifices the 2.5 bay for an extended battery). 4) Point above is made worse by the fact that the Nvidia (rather than the iGPU) runs the HDMI connection so if you plug a HDMI screen / projector in, there WILL be higher than expected battery drain (but hey, if you're plugging it into a monitor / projector you should have a plug close right?). You do get the possibility of External Gsync out of this compromise though (see Pro #6). 5) No Clevo-style "Flexi-Charge" (user configurable battery charge limits). At least not yet. 6) TBH, its sliiiiiightly thicker then the Aero 15 / GS series / P950, by a few CMs (due to the rubber feet at the bottom of the case)... if that's important to you. 7) Also, C panel is NOT metal, though the bottom fan vents are (it's like some hybrid build). I do like the plastics used though (more the GE63's textured, durable feeling material then the smooth, flimsy-ish stuff on the GS43). So yeah, initial thoughts. Will go even deeper once I get my unit for a full review. steberg, jaug1337, katalin_2003 and 2 others like this. - available with 144Hz screen ! - extra batttery capacity ! @XMG send a unit to NBC to be reviewed, STAT! I mean, I will run my own in depth review on my "version" once I get mine, but I'm thinking that this little thing deserves all the coverage (and hype) it can get, under whatever name. Also, nice smooth finishing and concave key caps! Gives a nice touch of character to the XMG unit to be honest, a shame you guys are half-way across the world from me. ... oh yeah some confirmation at last re: External G-Sync. Yep, quite possibly the same AUO 144hz IPS/AVHA panel used by the Asus Strix and the GS65 (and hopefully not the LGP one on the Aero v8). The big battery option is nice too - though being the media black hole that I am I've opted for the 2.5 bay + smaller battery combo for my own unit. Arondel, XMG and bubuch like this. Hmm looks interesting. I also bet this is AUO panel and as i suspected the 2.5 bay is sacrificed in favor to bigger battery. The KB is little strange though. It feels like mechanical but there is extra spring there which looks like it is supposed to make only clicking sound (it can be seen when you remove keycap). The KB isn't like any other laptop mechanical switches i had experienced (for example MSI GT75 or HP Omen X feel better). It might be some membrane/mechanical hybrid (i would have to destroy KB and this i can't do). I agree with most points made by eiraku. For more well i'm waiting for retail laptop. We will have one with nbc as soon as we've finished our tweeking!!!! Vistar Shook, steberg, Tony Palmer and 4 others like this. But yeah, TongFang's web presence is pretty iffy. It took me the LONGEST time to get ANY info about them at all while searching for details on this particular laptop and the previous TongFang barebones my local folks brought in. @Legion343 Yeah, they don't really feel like other "mech keyboard" types but I'm chalking that up to the in-house tech they're using, which doesn't look like Cherry or Kailh or whatever - because they don't feel like membrane (or even a mech/membrane hybrid) to me either, at least in consistency of travel and response. Maybe it's a scissors type mech switch, I know Kaihua was working on those since last year (though it was subtly different in form)... maybe TongFang got... ehem... "inspired" by those. Or, maybe it's just something else entirely. @bubuch Unfortunately, no, a 1060 (and maybe not even a 1070) is probably not enough to max out a 144hz screen, except maybe for some older (and "eSport") titles. But AFAIK you CAN set the screen to refresh to 60hz if you wanted to, or you can simply go get the 60hz screen instead, which isn't too bad. Also, the extended battery should be good for an additional 1-2 hours minimal over the basic version, which is a decent trade off IMHO if you need the battery life. I read the test and if it’s right temperatures are very correct!